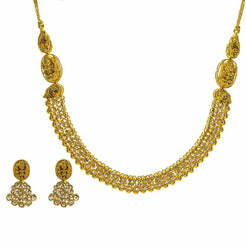 18K Yellow Gold Diamond Necklace & Drop Earrings Set W/ 7.42ct VVS Diamonds & Interchangeable Stone Feature for women. This breathtaking set is fully encrusted in 7.42ct VVS round brilliant diamonds. 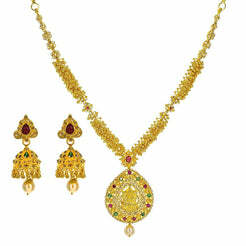 Pendant pieces can be interchanged for rubies or emeralds. 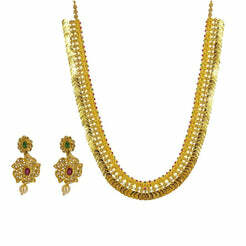 The necklace is 20" long with a width range of 3.5-9 mm. Its pendant is 40 mm long and 23 mm wide. Each earring is 37 mm long and 19 mm wide. This set has a total gold weight of 59 grams. Additional stones for interchanging will be provided upon purchase.